Enjoy a photographic tour of Pennsylvania's Delaware Division Canal! On this site are photos that the webmaster has taken in recent years of the Delaware Canal. The photos cover the entire 60-mile canal from Easton to Bristol. The dates after each photo is when the Webmaster took them. Each section has 3-6 photos in it. Look at the bottom of each page. Scrolling information is there. The Delaware Canal was built to bring coal to Philadelphia-Area markets. Construction began in 1827. It ceased operating in 1931. 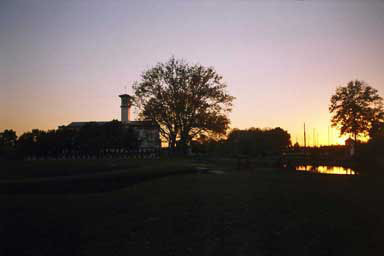 The Canal became a State Park in 1940. Hold your mouse on the photo (a few seconds might be needed) to see an alternate photo of Bristol Lagoon. When you take your mouse off the photo, the main photo returns. Alternate photo taken by the Webmaster, 10/25/03. The alternate photo may be changed periodically. For more information on either changing photo, click there to go to the Bristol Lagoon Photo Section. The photos on this web site show the canal in better times. Special Section! Lock 11, New Hope, PA being restored and made operational! Another website you might enjoy! Any comments? Send an e-mail message.